Richard’s animations Don’t Worry, Drive On, Who Killed Economic Growth? and 300 Years of Fossil Fuels in 300 Seconds (winner of a YouTubes’s/DoGooder Video of the Year Award) have been viewed by nearly two million people. While biologists have long agreed that humans are the dominant lifeform of the Anthropocene, some geologists now argue that, during the pivotal Concretaceous phase, it was the automobile that served as the true apex species. If you’re someone who’s curious about the geopolitical implications of carbon fuel and the ecological havoc it wreaks, you’ve probably come across some of Richard Heinberg‘s work. It is only by pulling together that we can hope to salvage and protect what is most intrinsically valuable about our world, and perhaps even improve lives over the long term. Rather than sharing the distractions now capturing the attention of other drivers, we must each retrain ourselves to pay attention to the instrument panel and the road ahead of us. A lot of people are asking the question these days—including serious folks who work full-time on climate and energy policy. Crime is always present in complex societies, just as all higher-order organisms are subject to parasites. Can Climate Change Be Stopped by Turning Air Into Gasoline? It sounds too good to be true. Is it? Richard Heinberg joins Juliet Jacobs at BFM radio to discuss realistic avenues for transitioning to renewable energy, the environmental implications of economic growth, and how we can build more resiliency into the sustainability movement. Richard Heinberg on ‘America First’. Will the US Really Be a Major Energy Exporter? What Geological, Economic, or Policy Forces Might Limit Fossil Fuel Production? Can We Have Our Climate and Eat It Too? Cap Fossil Fuel Production Now! Is the US Overplaying Its Energy Hand? What Happened to My 13 Billion Barrels? Who knew that Seoul was a leader in the sharing economy? Credit: Ecology Hour, Mendocino County Public Broadcasting Richard Heinberg talks about his new book Snake Oil: How Fracking’s False Promise of Plenty Imperils Our Future. Credit: KWMR Post Carbon | Download Interview with Richard Heinberg, author of Snake Oil: How Fracking’s Promise of Plenty Imperils Our Future, with Mainstreet Moms – Kris Brown, Kathy Calloway, and Mary Morgan. Richard Heinberg on Natural Gas: Bridge Fuel or Fool’s Gold? As a contribution to this ongoing refinement of the concept, I recently formulated five axioms (self-evident truths) of sustainability. My goal was simply to distill ideas that had been proposed previously and put them into a concise, easy-to-understand form. The First Axiom Any society that continues to use critical resources unsustainably will collapse. In The End of Growth, published in September 2011, Richard Heinberg, made the observation that world economic expansion, which has been barreling along for the past few decades, is now stalling. The book further claimed that this is not an outcome we can prevent; we can only choose whether and how to adapt. Renewable Energy & Beyond: How do we transition to a renewable society? Post Carbon Senior Fellow Richard Heinberg was interviewed on The Rundown on Our New Economic Reality. Segment begins at 6 minutes. 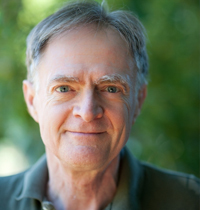 Richard Heinberg interviewed on RT’s Great Minds August 1st, 2014.
Credit: Spring of Sustainability Post Carbon Senior Fellow Richard Heinberg gave this interview in May 2013 as part of the Spring of Sustainability Teleseminar Series .